Instruments Taught: Voice (beginning through advanced), Guitar (beginning through advanced), Piano (beginning and intermediate), Bass (beginning and intermediate), Ukulele (beginning and intermediate). Musical influences: His Father (James Wright), The Beatles, Simon and Garfunkel, Carole King, Elton John, Frankie Valli and the Four Seasons, Stevie Wonder, Queen, The Zombies, Billy Joel, Sam Cooke, The Lovin’ Spoonful, The Beach Boys, The Hi-Lo’s, Cab Calloway, Smokey Robinson, Bobby McFerrin, Eric Clapton, Mozart. Education: Bachelor of Arts Degree in Music (Vocal Performance) from California State University, East Bay. Additional college education in Music History, Theory and Performance from Diablo Valley College in Pleasant Hill, CA. Musical Projects: The Dream Tellers, Common Bliss, James Wright (his father), Gabriel Cohen, Lara Patton, Tris Duncan. Books Used: Alfred’s Basic Piano Library, Piano Adventures, Music For Little Mozarts, Alfred’s Guitar Method, Mel Bay’s Children’s Guitar Method. Key teaching concepts: Enjoyment, relaxation, focus, attention, ease, precision, fluidity, and tastefulness. A recipient of a Bachelor’s Degree in Music from Cal State University East Bay, Nicholas James Lyon-Wright is a talented multi-instrumentalist whose infectious enthusiasm about all aspects music (teaching, playing, studying and learning) is inspiring to his students and peers. Nick is an accomplished vocalist, guitarist, and pianist/keyboardist who has a wide range of influences ranging from Classical to Classic Rock. His father, James, is also a musician and has been one of Nick’s biggest musical influences and motivations since he began playing music as a child. 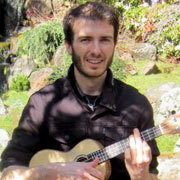 Some of the well known performers and educators in the Bay Area that Nick has studied with include: Buddy James (East Bay Singers/Chamber Singers/Jazz Singers), Pamela Hicks (Voice Lessons), Jeffrey Miller (Music Theory/Counter Point), Ellen Wasserman (Piano) and Owen Lee (Music Theory), Jan Deshera (Choir/Chamber Singers/Vocal Jazz), Bruce Cook (Piano), and Gary Valeriani. Nick can be seen performing locally at events, clubs, and open mic nights across the Bay Area alongside fellow Music Time Academy instructors Xavier Guerreo and Lara Patton under the name “The Dream Tellers” – an up and coming, classic rock/acoustic ensemble highly regarded for their well arranged vocal harmonies and fluid guitar work on both original material and cover music.